Slotland’s notoriously regular progressive jackpot hasn’t been hit since before Christmas, but that’s given the popular jackpot time to grow to a near record-breaking amount. This week, the Slotland jackpot jumped to over $160K, much higher than the last win of $110K. It could even go as high or higher than the largest win ever which was $195K won last March. Slotland’s jackpot, available on all of the slots and video poker games on the site, has a history of being hit every 4 – 6 weeks or so. Jackpots are usually $100,000 to $150,000. While the jackpots aren’t the biggest on the internet they are hit so frequently that they are always popular with online slots players. Last year, Slotland awarded nearly a million dollars in progressive jackpot wins. The jackpot can be won on any game but it doesn’t appear that any one slot machine or video poker game is luckier than an another. In the last year, big jackpots have been won on the Booster, on Wild Heart, on the new Four Cast and on the ever popular Treasure Box slot machines. 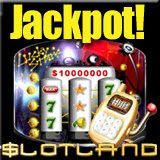 With the launch late last year of Megaspin, Slotland.com currently features thirteen unique slot machines and three video poker games. Four of the most popular online slot machines and two video poker games are also available on mobile phones and PDAs. All of Slotland’s games give players the option of placing a maximum bet for a chance at the progressive jackpot. All of the slots and video poker games on the mobile network are also tied to the same jackpot pools. Slotland is available in Spanish at Es.Slotland.com.